Love this watch. Goes well with every thing. I use it as my every day watch. 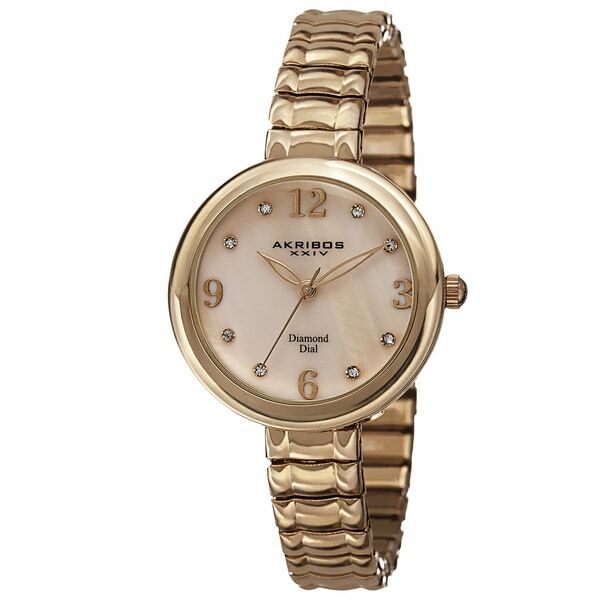 This delicate ladies watch from Akribos XXIV features a mother of pearl dial with genuine diamond markers. The elegant style is fused with the effortless and straightforward design of an expandable bracelet. Looks expensive without being flashy- mother-of-pearl face is beautiful with the gold finish of the strap. Beautiful watch, love the feature on the elastic wrist band for easy on and off. Wonderful quality. Love this watch. I would recommend this beauty for all ages! Very pretty watch and nice quality. Looks just as pictured. I wanted this to work as I loved the watch but the face was a little too small for me. It is not the fault of the watch, just my eyes! I am used to a very large face so going a little smaller would be hard to do. This is a lovely watch and it's sonhardcyonfind an attractive watch with an expandable band like this one has. I wanted a watch that was pretty for work but also that I could tell time very easy. This watch was perfect. Also I love the fact that you can just slip it on and go. It looks very expensive and the price was awesome!!! Very nice watch, you can't go wrong. This is a beautiful watch! I can wear it with everything and it looks dressy but still appropriate for everyday. I love the stretch band, it makes it easy to slide on. Lovely! Bought as a gift. The band fits well; not to loose not to tight. I’m very pleased with my Watch. I just slip it on and I fix my sleeves where people can see it. I can see the time very good! "Does it run on a battery? How difficult do adjust the band size?" This watch is powered by a quartz movement.